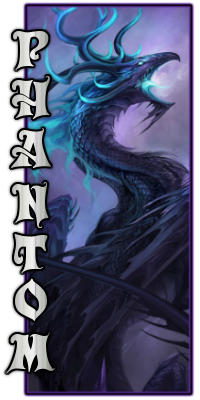 Personality: Phantasmas....is a interesting engima of a dragon of his kind. He's friendly to strangers, especially friendly to hatchlings, and might have a hard time telling whose good or evil initially. Even though he is extremely loyal to those he would call his friends, he won't open up completely to them until he could fully trust them. At which point his old, calculating self might surface every now and then, a constant remainder of how shattered his mind had once been long ago and how any could be completely different under the surface. Scales: Pale blue and an armor-like scale pattern. Appearance: His main appearance, now back to normal due to releasing his trapped soul, is still that of a normal dragon. Still pretty old, but at least young enough to walk normally and fly again on intact wings. His horns are full, still worn, less wrinkles, his beard is more manageable and a grayish white now, with a slightly bulky build for his body. The once fully frayed wings now intact fully and his claws no longer as dull from before, his tail no longer cramps every time he moves it along with being a natural thickness again. he can only keep them up for 5 minutes. These copies also cannot; travel further then 150 ft. from Phant or immediately dispel upon doing so, immediately dispel upon taking a fatal hit, and persist for only 5 minutes without support. To make an illusion true-reality, it takes up all his focus and magic to make one, single, illusion a real life thing for 1 minute and reflections do not reveal it's true nature. If an object, the illusion takes on all the properties of said object along with any magical parts, though at a reduced potency. If a creature, example a dragon, this copy is psychically equal to and has the same powers as the original, only up to 50% potency for powers. To do this Phant must have at one point made physical contact with the creature in question and have a basic understanding of said individual's personality. After the minute passes, the illusion dispels and Phantasmas is left exhausted physically, and mentally, along with being drained of 99% of his magical energy to the point of helplessness. Combat Style: Prefers not to fight, but will use illusions to make his enemy think they won, then either escape, or strike a fatal blow. History: Back many centuries ago the enigma know as Phantasmas had gone under a different name much long-forgotten to time, Malygos, the Rouge Scholar. A young, dark blue dragon with no actual Sea Wing heritage to him made a name for himself with his intent study on the nature of magic and caught some unwanted attention. Forced to remain on the move he knew he couldn't keep studying like this and felt angry that some jealous others felt his work to be so unwanted. During one of his many relocation's his fate took a turn when he met by pure chance his future mate, Casadora, a white dragon one would think to be a Lightwing if such a tribe had existed long ago before now. The meeting took more turn for the surprise when she took a liking to him as well and both conversed until her recently unknown fellow siblings found them. His first meeting with the 5 brothers...had been eventful, and after some stern convincing they asked if he wanted to be part of what would be considered a Rouge Tribe. At first dumbstruck, he merely accepted the offer without realizing it, causing the brothers to resume an hours long argument over their 'little' sisters decision. After many ups and downs throughout his life, he had gotten to know each and every one of the small tribe he called family. Slowly, but surely, he warmed up to each of his 'brother-in-laws' and happily spend his new time with his mate Casa. Finally, he found the peace and relative quiet he wanted for his research to go unimpeded from prying and jealous eyes. As such though, as years turned to decades, decades to centuries, and finally, the spark that broke what bonds he had forged over centuries occurred. A simple truth broke Malygos fragile mind, a mind that barely held on with how corrupting magic can be to any being, Casadora could not bear eggs and he couldn't do anything. After that, he became more reclusive and more withdrawn into his studies. Avoiding all contact and with a worried plea the 5 brothers went off to find out where and why he had disappeared. It had taken some time, but they had finally found his hidden den and with a plan, went into the depths. What they had not taken into account had been in his mania Malygos still remembered all the brothers strengths and weaknesses. One by one, each brother fell to the insidious traps he placed specifically for each one and only one remained alive to face the insane elder. In the midst of the clash Casadora lost her life trying to stop them both and in that moments hesitation, the last brother struck a mortal blow to Malygos. The last of his strength gone, the final brother finally succumbed to his wounds, and in a final move of desperation the insane Malygos used a final spell to transfer his soul into a crystal catalyst. Only for this spell to have one flaw, his mind also went into the crystal and as such, a completely different personality of his old self took over his now vacant body. After a couple of millennia and with the crystal now broken, both personalities have merged to become whole again along with becoming a normal dragon, though remnants still linger in his magical power of what he once wielded long ago. I did not realize your name, so sorry about that.